In today’s Hangouts update, two new features that weren’t previously mentioned have been pointed out by Mayur Kamat, who is the product manager of Google Voice and Hangouts. Kamat notes that it is now much easier to toggle between your Google Voice and carrier numbers when sending an SMS. If you tap on the “spinner,” which to me is the drop-down menu on the left side of the Hangouts input box, you should see choices for sending a message via Hangouts or SMS just like you have before. But now, I’m seeing a blue SMS box for sending via my Google Voice number and a grey SMS box for my carrier number. Pretty simple fix, but definitely useful. 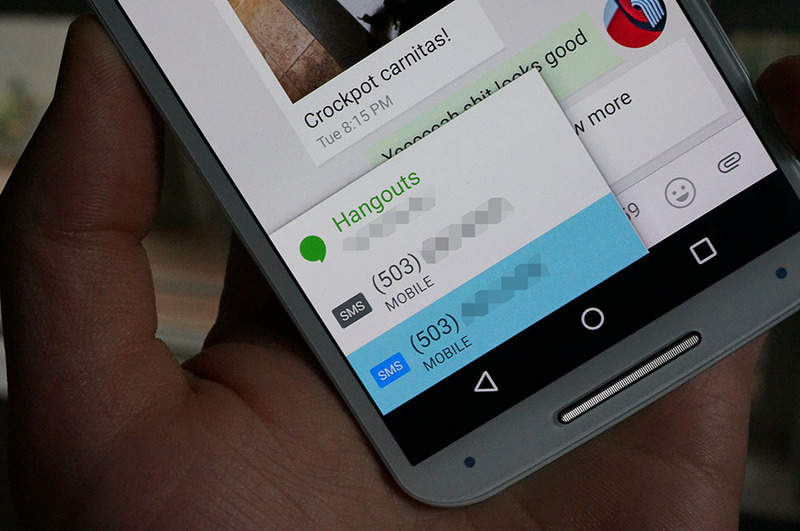 Also, the new Hangouts update lets you add people to your contact list from call history in the Hangouts Dialer. Kamat says that a “lot more stuff” is rolling out over the week, so we should stay tuned.